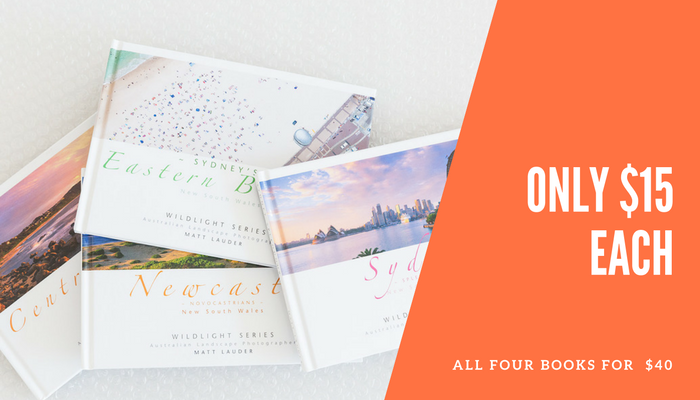 After shooting the coast line between Sydney and Newcastle extensively over the last 16 years it seamed like the right thing to do by putting together a nice range of books to showcase each area. It is interesting that when you decide to do a series of books you realise all the location gaps in your collection that need shooting. I first tested the waters with my Newcastle book and that was a raging success and the book sold out of its first print run. On the re order of my Newcastle book I then pre pressed and self published the other three titles in the Wildlight series, titled The Central Coast, Sydneys Eastern Beaches and Sydney Splendour. Each book has a RRP of $15 and discounts are offered with multiple purchases. All books are hard backed, 64 pages in length and have over 40 images in each book. When closed are 21cm x 15cm and weigh 267 grams and when posted can go as a letter rate by Australia Post, which is great. The Wildlight Series of books are far from complete. My “Your Northern Beaches” book is about to end it’s current print run and I am working on a new range of images for the book to be re published as a Wildlight Series book later this year along with a few more local titles as well. All the books are available online or through outlets as mentioned on the site. The books can also be fully customised for corporate customers just drop me / us an email and we can talk over options and pricing. Below are details about each book along with an accompanied video showing you every page within the book. I had wanted to do a Sydney book for sometime, I had enough images for years, but what I was missing was something different, that no other photographer had added into their landscape books of Sydney and this was a range of unique aerial images. These images complement the landscape images perfectly and they are part of the unique look the Wildlight Series books offer. The Sydney book features images from all along Sydney’s coastline drawing from our Eastern Beaches, Northern Beaches and Sydney City online galleries, with a focus on the city itself being such and international icon and trademark for Australia. Within the book I researched and included some great details about the Sydney Opera House and how it came about from a design that was originally scrapped and in the bin. History of the Sydney Harbour Bridge and the amazing details of whats gone into making it. Did you know it takes 30,000 ltrs of paint to paint it. When looking at doing a landscape book for the Eastern Beaches I was surprised that a book for the area hadn’t been done. Of all the books I have currently done, this is my personal favorite. I had such a great range of images to work with and having just completed an aerial shoot in November 2012 I was spoilt for choice of what to put images to put into the book, 64 pages wasn’t enough, but it was all I had. All the beaches are featured with Bondi being a standout, but the book certainly isn’t a “Bondi” book by any means. The Central Coast is where I have called home for the last 6 years. It is the perfect location to access the places where I love shooting the most, the coastline from Newcastle to Sydney. Within an hour I can be on Newcastle Beach or almost Cronulla. With the Central Coast being home I had over 250 images to choose from and with a book that takes just over 40, picking was not easy. The book has a great balance of local surf culture, aerials and the landscape of both the ocean and inland estuaries. Last but not least is my Newcastle book, like the Sydney Splendour Book it is in it’s second print run it has been that popular with the locals and why shouldn’t it. It is also the only landscape book of Newcastle that is around. The book covers all the local beaches, ocean baths and headlands. Full of aerial photography of the area as well. A historical snap of the Pasha Bulker along with details about the event. I researched a lot for the book and included a nice amount of history about Newcastle and places like the Bogey Hole. Fascinating stuff.